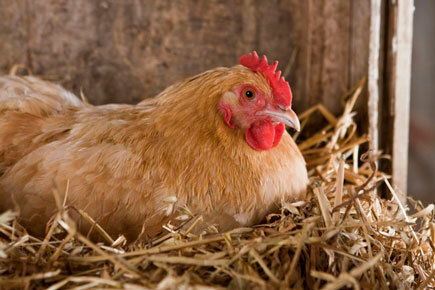 Pretty Peggy was hatched in a hatchery in NE Iowa and arrived via parcel post in early spring of 2003. She quickly distinguished herself from her hatchery mates by being an extremely friendly and sociable chicken. She would take vegetable scraps from your hand and would let you pick her up and stroke her soft feathers. She was a quick learner and seemed to enjoy the attention she received while performing as an animal actor. She pretty much lived the life of a barn yard chicken scratching for bugs, eating weeds, gobbling up corn like candy until she was picked to play a distraught wife in the Perkin’s Restaurant and Bakery commercial, “Psychologist”. She had to sit calmly in a chair in a psychologist’s office and tell the therapist how her husband, a Brown Leg Horn rooster named Raphael, was not an early riser and how this caused her a great amount of concern. After two days of pre-training and many yummy bites of lettuce and strawberries Pretty Peggy gave a performance to be remembered. Her distress at her husband’s sleeping habits is clearly visible as she clucks and squawks through her scene. She later went on to perform in two more Perkins commercials. One as part of an audience when the Rooster confesses that he in not a morning person and another where she plays a chicken surprised to hear the rooster mooing instead of crowing. 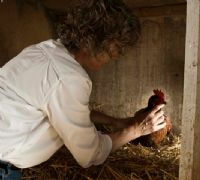 Since then, Pretty Peggy had been the star of Omega Fields latest print campaign where she had to play a happy hen sitting on a nest of eggs in a laying box. Pretty Peggy is currently being featured in one of farm lifestyle photographer, Barbara O’Brien’s fine art photographs. The image called “Hens Dancing” is part of her farm animal photography collection showing at the Pepin Art at Design Gallery in Pepin, Wisconsin during the Fall of 2009. Pretty Peggy can also be found in Barbara O’Brien’s 2010 Chicken Calendar. Pretty Peggy relished her star turn and is proud and pleased to be a spokeschicken for Omega Fields. Pretty Peggy, along with her 2 dozen other coop mates are fed a high quality lay mash with a top dressing of Omega Ultra Egg that results in her optimum health and dramatically increases the Omega-3 level in the eggs from less than 40mg per egg.